I have a funny little face to go with my funny name, which translates from German as "monkey terrier". My early relatives back in Germany worked in the horse stables as ratters, but these days most of my family and friends have jobs like mine. I am technically classified as a "family pet", but I can also do lots of things around the house for my people. I watch over things and let them know immediately if anyone is driving up or snooping around. Don't let my small size fool you. I am not a delicate little dog. I am sturdy and solid and I am intelligent to boot! Not to worry for a second if you don�t have a big house for me to help you watch after. I can be very comfortable in an apartment. When fully grown, I am between 9.5 and 11 inches tall (24.1 to 27.9 centimeters) and I weigh between 6.5 and 9 pounds (2.9 to 4 kilograms). We have no Affenpinscher Breeders listed at this time. 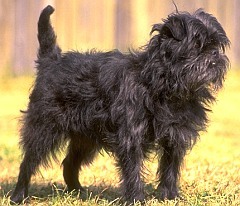 Click here to place your Affenpinscher Ad!